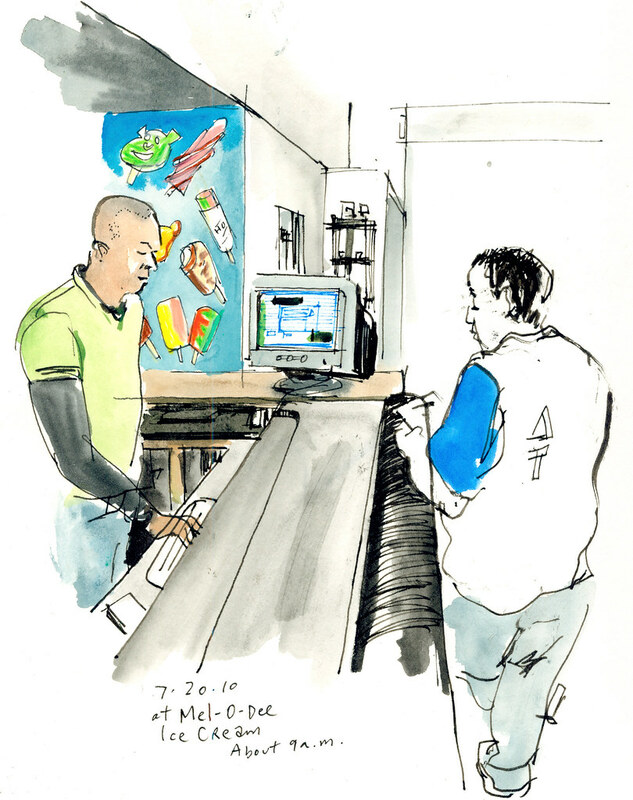 An illustrated journal of life in the Puget Sound region by Times artist Gabriel Campanario. These days the sound of the ice-cream truck coming down the street puts my neighborhood in a good mood. Kids quickly fill the cul-de-sac and jockey for position to get their cold treats. But ice-cream vendors say not everyone is that welcoming. 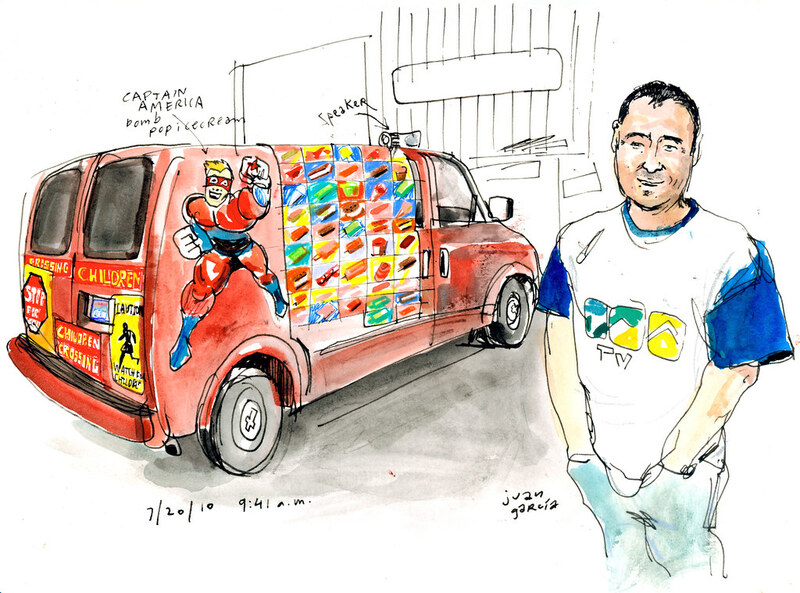 “Some people complain about the music being too loud,” said Juan Garcia after packing his van full of bomb pops, big dippers and snow cones at Mel-O-Dee Ice Cream, a distributor amid warehouses in Georgetown where I met customers coming from as far as Everett. Walid Alabtan, a 13-year vendor, said at the beginning, people would tell him to leave. He heard so much “go! go!” that he named his business Go Go Ice Cream. Who would want to send the ice-cream truck away? I wondered. That seems cold! Here are some other sketches from the morning I spent with the ice-cream vendors. Garcia reads off his order to store manager Abdul Razak Falih. Alabtan treats himself to one of his own ice cream bars. 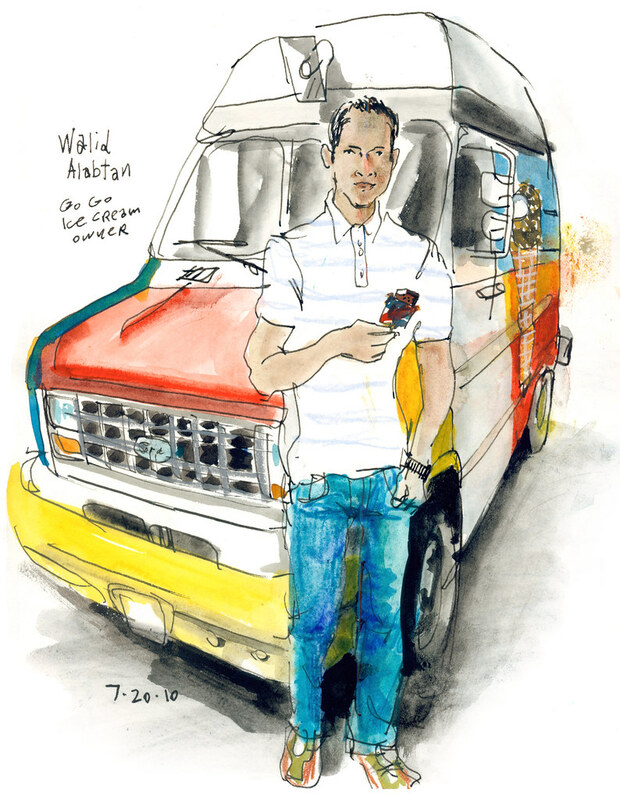 He said he has the best looking ice-cream truck in Seattle. 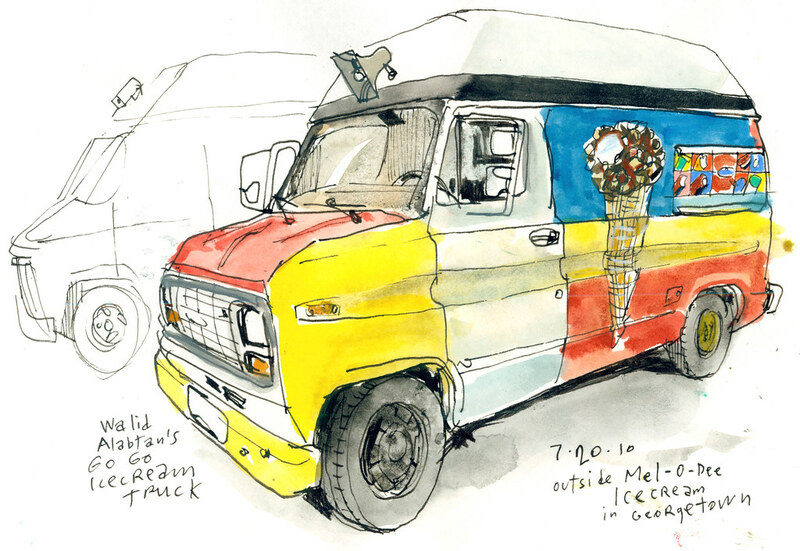 A side view of Alabtan’s Go Go Ice Cream truck. 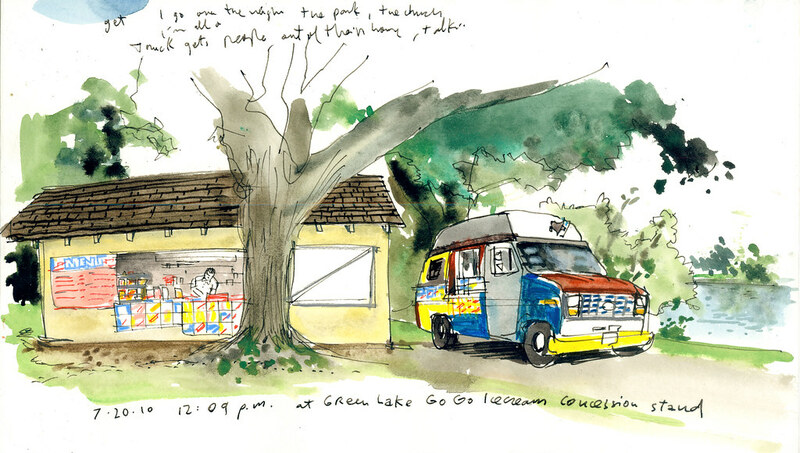 After packing the van with dozens of boxes full of ice cream, Alabtan took them to his concession stand on Green Lake. “This is the most fun job I’ve ever had … I want to do it for the rest of my life,” said the 40-year old entrepreneur, who hopes his children, now 8 and 13, will follow on his footsteps. For now, they get free ice-cream when he takes them on short rides around the neighborhood on Sundays. “They make beautiful memories,” he said. Gabriel Campanario has been living and drawing in Seattle since '06. 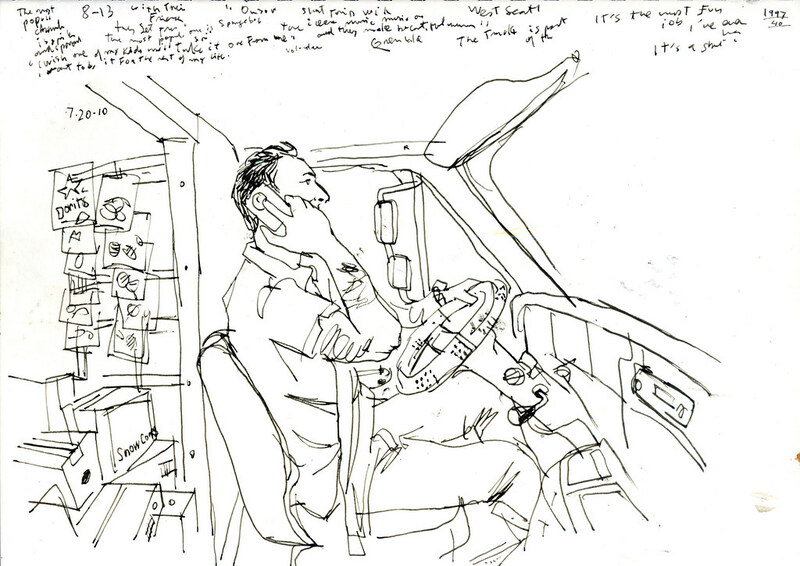 He's a Seattle Times artist, founder of Urban Sketchers nonprofit, Spaniard, husband and father. You can follow him on Twitter and Facebook. You can now take home the work of Gabriel Campanario. Visit The Seattle Times Store for Seattle Sketcher merchandise based on his popular blog & sketches. Shop now.